Nelson Rolihlahla Mandela (18 July 1918 � 5 December 2013) was a South African anti-apartheid revolutionary, politician and possibly South Africa�s most respected citizen. He served as President of South Africa from 1994 to 1999, was South Africa's first black chief executive, and the first elected in a fully representative democratic election. His government focused on dismantling the legacy of apartheid through tackling institutionalised racism, poverty and inequality and fostering racial reconciliation. A Xhosa born to the Thembu royal family, Mandela attended university where he studied law. He became involved in anti-colonial politics, joining the ANC and, after the South African National Party came to power in 1948, he rose to prominence. Working as a lawyer, he was repeatedly arrested for seditious activities and, along with the ANC leadership, was unsuccessfully prosecuted in the Treason Trial which ran from 1956 to 1961. Influenced by Marxism, he secretly joined the South African Communist Party. Although initially committed to non-violent protest, in association with the SACP he co-founded the militant Umkhonto we Sizwe in 1961, leading a sabotage campaign against the apartheid government. In 1962 he was arrested, convicted of conspiracy to overthrow the state, and sentenced to life imprisonment in the Rivonia Trial. Mandela served 27 years in prison, initially on Robben Island, and later in Pollsmoor and Victor Verster Prisons. An international campaign lobbied for his release which took place in 1990 during a time of escalating civil strife. Mandela joined negotiations with President F. W. de Klerk to abolish apartheid and establish multiracial elections in 1994, in which he led the ANC to victory and became South Africa's first black president. During his tenure in the Government of National Unity he invited other political parties to join the cabinet, and promulgated a new constitution. He also created the Truth and Reconciliation Commission to investigate past human rights abuses. While continuing the former government's liberal economic policy, his administration also introduced measures to encourage land reform, combat poverty, and expand healthcare services. He declined to run for a second term, and was succeeded by his deputy, Thabo Mbeki. Mandela became an elder statesman, focusing on charitable work in combating poverty and HIV/AIDS through the Nelson Mandela Foundation. Mandela was a controversial figure for much of his life. Denounced as a communist terrorist by critics, he nevertheless gained international acclaim for his activism, having received more than 250 honours, including the 1993 Nobel Peace Prize, the US Presidential Medal of Freedom, and the Soviet Order of Lenin. 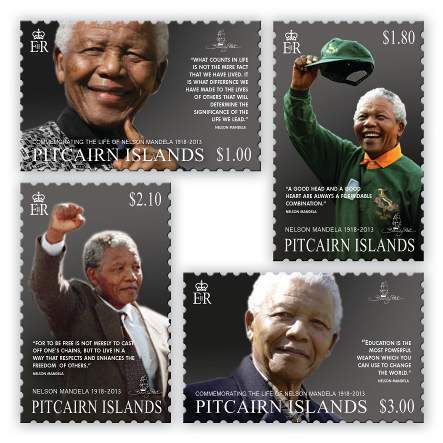 The Pitcairn Islands Philatelic Bureau commemorates the life of this great man one year after his death. 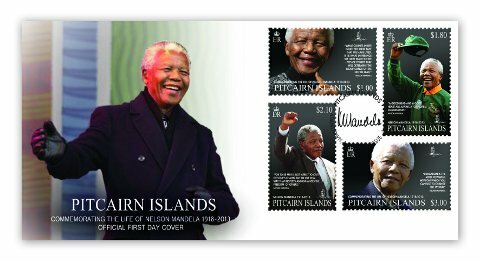 Mandela is held in deep respect within South Africa, where he is often referred to by his Xhosa clan name, Madiba, or as Tata ("Father") and is often described as the "Father of the Nation".